Honeyville's Dried Whole Eggs are produced exclusively from fresh eggs harvested from chickens in the United States. The eggs are spray dried and pasteurized in the USA for optimal quality and safety. Honeyville's Powdered Whole Eggs are produced though a special process designed to provide a free flowing powder that has been pasteurized for your safety. Originally developed for use in the military, our whole egg powder, when blended with water, reconstitutes into a product similar to fresh whipped eggs. These reconstituted eggs may then be used as a direct substitute for fresh eggs. One 2.25 pound can of Powdered Whole Eggs is equivalent to about 81 to 90 Large Fresh Whole Eggs. Our whole egg powder is non-perishable and requires no refrigeration and is ideal for camping, travel, and long-term food storage. This product may be stored for up to 12 months opened, and 5 to 10 years in airtight sealed cans. To reconstitute one egg, mix 2 Tablespoons of powdered whole egg with 4 Tablespoons of water. Use for any recipe that calls for eggs. When using with other dry ingredients, it is not necessary to reconstitute egg. Simply add to other dry ingredients and increase water measurements in mixture to necessary amount. Spray dried whole eggs can be used in any application where fresh eggs are called for including scrambled eggs, omelets, and as a protein supplement in your favorite smoothie or health drink. Powdered eggs can be added to your favorite recipes with comparable results. Since powdered eggs have been pasteurized, there is no need to cook the product. Once a powdered egg has been rehydrated it should be treated as a fresh egg and used immediately. Dried eggs are great for camping, hiking, and survival preparation. The long storage life and ease of transport make dried eggs and egg whites ideal for outdoor preparation. 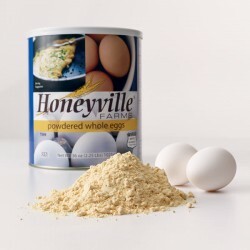 Honeyville's Powdered Whole Eggs can be stored 5 to 10 years sealed and unopened, and up to 12 months opened. As always storage life is dependant on storage conditions. Always store food products in a cool, dry place for optimum storage life. Each # 10 Can of Dehydrated Eggs contains 2.25 pounds of product. A #10 can measures 7 inches tall and is a little over 6 inches in diameter, or roughly the size of a large coffee can.